I doubt I’ll have time to start posting again regularly, but I just wanted to say hi and share a couple of fun Halloween recipes. Last year Henning and I had a Halloween party and we went a bit wild with the themed food–let’s just say there was a kitty litter cake involved and leave it at that. These two slightly more tame recipes are sure to be a hit at your Halloween party. The first is for spooky witch finger almond cookies. They taste great and are creepy too! 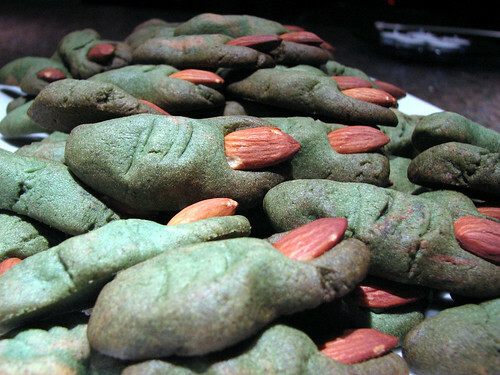 Crunchy almond dough is dyed green and almonds serve as fingernails. If you’re feeling ambitious, you can paint the nails with red food coloring, or even squeeze red decorator gel under the almond nails for a super nasty effect. 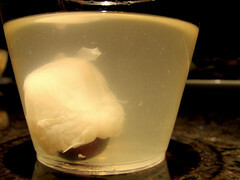 The next is a great recipe for Eyeball Punch. 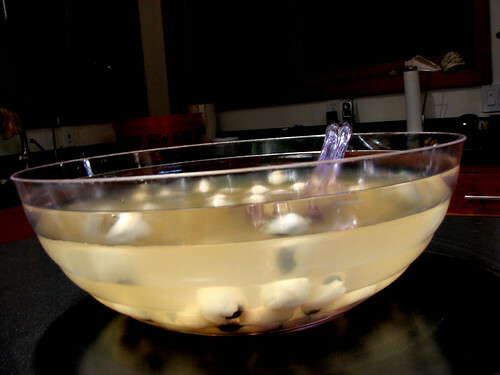 The punch was a huge hit at the party, and it makes such a great impression with relatively little work. Eyeballs made out of canned lychees stuffed with grapes float in a clear (spiked, if you wish) fruit punch. Yum! We also made a bloody hand out of cranberry juice frozen in a rubber glove, which added some extra punch to the punch. The idea for the eyeballs came from an old German magazine. Those crazy Deutschlanders, so creative! I’m a bad blog mommy. As soon as things get hectic, I drop the blog baby and tend to the others, who are more likely to kick and scream. I’m sorry, baby. But there’s just a lot going on right now. Henning is back from Germany and I’m leading some younger graduate students in a qualifying exam prep session and I’m still trying to write a thesis. I’m cooking easy, tasty dishes that can be whipped up in an instant. I’ve got one of my favorites to share with you. Yeah, I know. Just some cucumbers? Yes, and no. This simple cucumber salad is a favorite summertime snack of mine, even more so this summer since I’m growing cucumbers in my garden. The difference between storebought and homegrown veggies is really quite amazing. I mean, I always knew this somehow, but this summer has really shown me. The difference between zucchini picked fresh from my garden and even that bought at the farmer’s market is tremendous. But I digress. 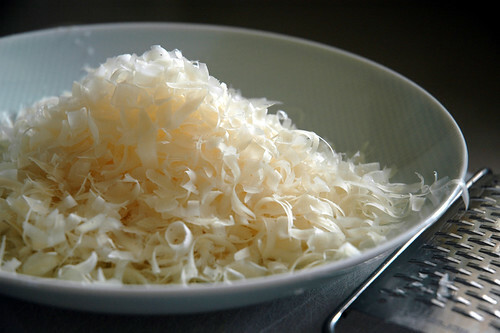 This simple salad is nothing more than slices of cucumber, a splash of mild vinegar, and a pinch each of salt and sugar. 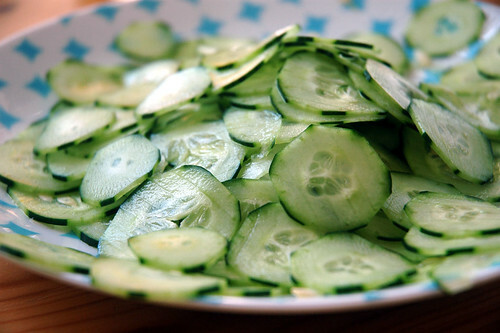 It’s simple, cooling, refreshing, and delicious, especially with homegrown cucumbers. 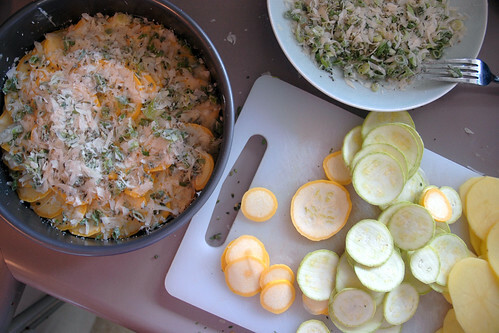 Ah, the humble summer squash. It’s growing overboard in many a garden right now. Your neighbors are probably stopping by to ask if you’d like any zucchini, cause they just picked one the size of Texas that was lurking beneath an unturned leaf, and by the way, do you like yellow crookneck? 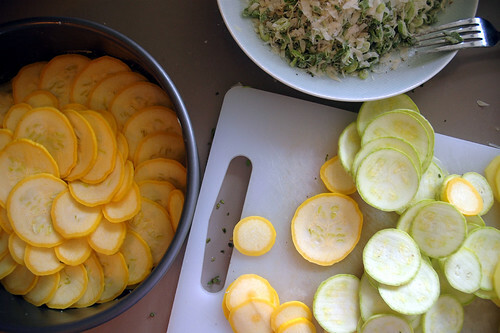 Say yes, because then you can turn this prolific summer vegetable into this sassy potato and squash torte. This torte dresses up the humble potato and $1-per-pound squash that’s overflowing farmers market stalls right now. It’s quite pretty and it’s tasty enough to be the centerpiece of a summer vegetarian dinner party, but secretly it’s just a matter layering the sliced veggies with some herbs and parmesan and sticking it in the oven. 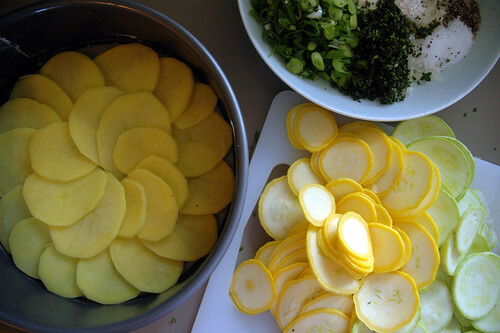 Somehow, when baked together with thyme, green onions, and parmesan cheese, the earthy potatoes and sweet summer squash are elevated far beyond their usual status of standard side veggie and into the realm of the extraordinarily delicious. Since there are only a few ingredients in this torte, make sure that they are all of high quality. The fresher the squash and firmer the potatoes and nuttier the parmesan, the better it will be. As you may or may not have noticed, there’s a new book in the “Must Reads” sidebar. That’s because I bought Hugh Fearnley-Whittingstall’s River Cottage Meat Book, and I am obsessed. I’d heard rumblings of the existence of this book from a variety of sources, and decided to take a look at it. I couldn’t immediately locate it on amazon (though it’s available now), and checked the UNC student stores on a whim. When I saw it on the shelf, I knew I had to have it immediately. First and foremost, you really have to commend anyone who titles their book “The Meat Book,” and give it shelf presentation of a beautiful hunk of beef and “Meat” in big bold letters. And it’s not even an Atkinsian diet book! The Meat Book looks like, and essentially is, a textbook about meat. It starts with a discussion of the morality of eating meat, and comes to the very sensible conclusion of “meat’s ok” (thank goodness, otherwise what would the other 530 pages be about?). He doesn’t, however, give the reader carte blanch to go out and eat any ol’ shrink-wrapped slab of bastardized animal flesh one finds on the grocery store shelves. Instead, he goes into a lengthy discussion about the exact conditions necessary for it to be morally excusable to eat meat, and most of those conditions are swept to the wayside by the commodity meat industry. If the treatment of animals isn’t enough sway you, though, (and it hasn’t always been for me, to be fair), Hugh tells you the true delights of eating slow-grown, heritage animals fed appropriately and treated with respect. They range from gastronomic to nutritional, and each one is reason enough, on its own, to find a better meat source. All that aside, the book sells itself on many other points. First is a step by step illustrated guide to buying good, quality meat. Every cut of every imaginable land animal is discussed in detail, from nose to tail. The last chapters (and good 3/5ths of the book) are dedicated to specific recipes to guarantee you never have a bad meat based meal again. And that’s Hugh’s point, in the end. Meals including meat should always be relished, a cause for celebration. And good meat, prepared well, always is. Also worth noting is the fantastic photography that permeates this book. Not always for the light-hearted, there are beautiful photos of finished dishes, cuts of meat, and whole animals. One of the first sequences is a set of photos from the slaughter of a cow. The pictures help to remind the reader that every piece of meat came from an animal, and that animal lived a life that was controlled largely by the price you’re willing to pay for it. It’s a reminder sorely lacking from the latest Tyson offerings. And so it goes on, until we finally settle on a main dish and some veggies that fit our requirements: (1) sounds yummy, (2) dishes complement eachother, (3) ingredients are in season, (4) makes a well-balanced meal. It usually takes us a while, and sometimes we end up taking ideas and pieces from different recipes and creating our own. That’s exactly what happened last night. I was in the mood for green beans, and we were planning to grill some scallops and serve with a Meyer lemon relish from a Chez Panisse cookbook. My mom thought that maybe we should have some potatoes, since we’ve been eating bread for our starch a lot lately. Since we were grilling the scallops, we thought it would be fun to grill the green beans and potatoes as well. 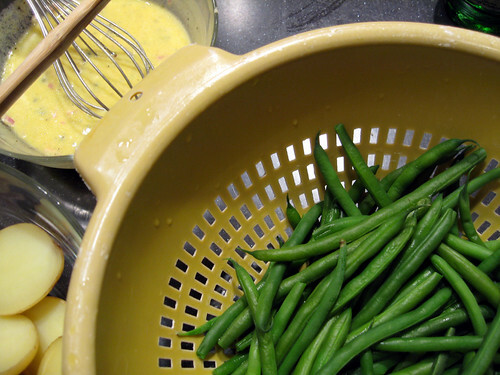 We saw a recipe for a French green bean salad in one of Jamie Oliver‘s cookbooks, and the dressing sounded great. I thought we could combine the beans and potatoes and toss them with the dressing. So that’s what we did. 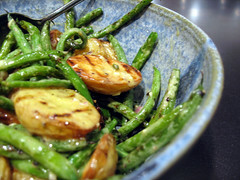 The result is a fantastic grilled green bean and potato salad that is so simple to prepare. Good hot or at room temperature, it would make perfect picnic food. The dressing is boldly flavored with plenty of mustard, white wine vinegar, shallot, and capers, and the potatoes and beans have that slightly smoky grilled taste. I can’t think of a protein that this dish wouldn’t be at home next to—anything from boiled shrimp to grilled pork cops to filet mingon would benefit from a little of this grilled salad on the side. You've arrived at yet another spot on the internet napkin. This time, it's a food blog, and your hosts are sisters Maia of San Diego, CA and Laurel of Chapel Hill, NC. Eat up! RSS allows you to use a feed reader to check for updates to this blog. This blog has two feeds, one for Entries and one for Comments. Liked it here? Try these!